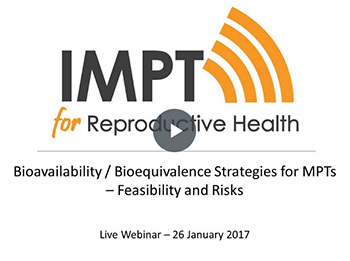 This live webinar focused on critical conversations around bioavailability and bioequivalence strategies for MPTs, including feasibility and risks. The webinar featured a presentation by Charles DiLiberti of Montclair Bioequivalence Services and a facilitated discussion with Laneta Dorflinger of FHI 360 and Joseph Romano of the IMPT. DiLiberti,C., Dorflinger, L., Romano, J.